Dassault Aviation has initiated the termination process of the Silvercrest contract leading to the end of the Falcon 5X program, and announces the launch of a new Falcon program with an entry into service in 2022. The delivery of compliant Silvercrest engines was originally planned for the end of 2013 in accordance with the Falcon 5X flight test schedule. But Safran was plagued with recurrent technical issues during the program development. In 2015 and 2016, major technical issues led Safran to announce a new schedule leading to the delivery of engines for the Falcon 5X flight article by the end of 2017. Consequently, Dassault Aviation had to postpone the entry into service of the Falcon 5X from 2017 to 2020, a 3-year delay. This slippage has caused customers' concerns and order cancellations, including 12 in 2016. Equipped with a preliminary version of the engine, not compliant with the specifications, the Falcon 5X performed its maiden flight, on July 5, 2017, and started a preliminary flight test campaign, limited by engines capacity. The Falcon 5X flight behavior met all the expectations. Considering the magnitude of the risks involved both on the technical and schedule aspects of the Silvercrest program, Dassault Aviation has begun the termination process of the Silvercrest contract leading to the end of the Falcon 5X program and plans to start negotiations with Safran. 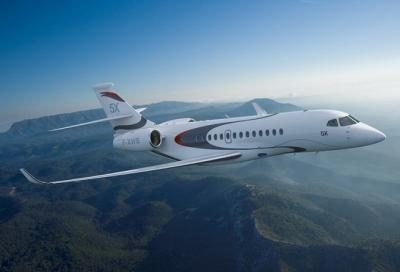 "There is still a strong market need for a brand new long range aircraft with a very large cabin," said Dassault Aviation CEO Eric Trappier, "so I have decided to launch a new Falcon project powered by Pratt & Whitney Canada engines, featuring the same cross section as the Falcon 5X, a range of 5,500 nm, and scheduled to enter into service in 2022."